Everyday White SS Pocket C5 229X162 90gsm PK25 Pack of 1 Q-Connect White Envelopes. Flawless Bright White Wove envelopes with an opaque interior ensuring letters remain confidential. 90gsm envelope with self seal flap. Size: (C5) 229mmx162mm (9x6.5inch). Everyday White SS Wallet DL 110X220 80gsm PK50 Pack of 1 Q-Connect White Envelopes. Flawless Bright White Wove envelopes with an opaque interior ensuring letters remain confidential. 80gsm Banker style envelope with self-seal flap. Size: (DL) 110mmx220mm (4.25x8.6inch). 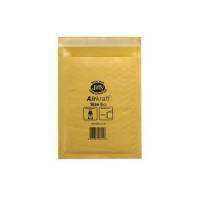 Jiffy AirKraft Mailer Size 0 140x195mm Gold GO-0 (Pack of 10) MMUL04602 Pack of 1 Bubble lined bag for protection. Durable material resistant to ripping. Resistant against bad weather. Lightweight for economical posting. Dimensions: 140x195mm. Supplied in a pack of 10. Colour: Gold. PostSafe Envelopes Extra Strong Opaque 335x430mm (PK5) Pack of 1 Extra strong, extra durable but still lightweight and waterproof, suitable for heavier catalogues, computer printouts and mail order textiles. Incorporates a special White panel to accept any endorsement. Opaque. 325mmx430mmx60mm (12.7x16.9x2.4).